WASHINGTON (February 1) -- Expenditures by Independent Counsel Ken Starr's office have officially surpassed the $40 million mark, according to new Justice Department figures. Although some Starr critics had previously tagged him with spending as much as $40 million, the figures contained in a Justice Department budget document released Monday represent the first government confirmation that his investigation costs have reached that level. The figures show that Starr's office, through the end of November 1998, had spent $40,835,000. That includes $27,749,000 in direct expenses from independent counsel appropriations and $13,086,000 in unreimbursed expenses incurred by other government agencies. Those figures do not include costs incurred by Starr's predecessor, Robert Fiske, whose office spent about $6 million before Starr was appointed to lead the investigation. Expenses by all independent counsels are approved by a federal court and passed on to the Justice Department for payment. The Government Accounting Office (GAO) then conducts biannual audits of independent counsel spending. The GAO's most recent report issued last September showed Starr had spent $33.5 million through March 31st, 1998, after taking over for Fiske in 1994. The next most expensive ongoing investigation belongs to Independent Counsel Donald Smaltz whose four-year investigation of former Agriculture Secretary Michael Espy cost $19.3 million through the end of November. Espy was acquitted in December of all 30 counts accusing him of taking illegal favors and gifts from companies he regulated. 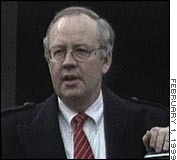 The most expensive independent counsel probe to date still belongs to Iran-Contra Counsel Lawrence Walsh, who spent $47.4 million.